The more you know about the risk factors that contribute to sunburn and how to treat sunburned skin, the better you'll be able avoid the burn and keep your family sun-safe, too. Before soaking up the rays this summer, find out what the sun is really doing to your skin. Get the scoop on common tanning myths and what you can do to avoid UV damage. Nothing is as important for your skin as being sun smart, so it’s tempting to think that you can skin the sunscreen step and instead eat certain foods or take a sunscreen pill to save your skin…but is it true? As if the entire subject of sunscreen and SPF ratings weren’t confusing enough already, along came the PA+ rating system to up the ante of bewilderment! This is how to easily understand the meaning of SPF versus PA+ ratings. Daily use of sunscreen is the #1 way to fight off the signs of aging, but how are you supposed to reapply over a full face of makeup? We’ll tell you how to revive your SPF without messing up your look. The sun emits two types of rays that reach Earth and affect your skin. We explain how they differ and how sunscreen actives work to protect skin from visible effects of ageing and more. You know you should apply sunscreen every day, but they can be frustrating: Some leave a white cast, some sting your eyes, or they don’t work under makeup. Here’s how to easily overcome those issues. Unprotected sun exposure causes skin cancer and premature skin aging! Understanding how sun damage affects skin and how to prevent it is critical information for your skin. You know sunscreen protects skin from sun exposure, but just how does it do that? We explain how synthetic and mineral sunscreen ingredients work. 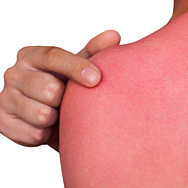 You most likely have had at least one sunburn, but how much do you really know about what sunburn does to skin? Sunburn has a startling impact on your body, not just now, but for years to come—a strong reason to keep that sunscreen handy! You’re getting ready for a day outdoors, you’ve applied your sunscreen—but are you really covered? We’ll show you the sneaky places the sun can get to, and how to make sure you’re SPF-ready all-over.